For other uses, see Canadian Corps (disambiguation). The Canadian Corps was a World War I corps formed from the Canadian Expeditionary Force in September 1915 after the arrival of the 2nd Canadian Division in France. The corps was expanded by the addition of the 3rd Canadian Division in December 1915 and the 4th Canadian Division in August 1916. The organization of a 5th Canadian Division began in February 1917 but it was still not fully formed when it was broken up in February 1918 and its men used to reinforce the other four divisions. 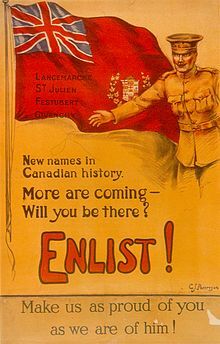 The majority of soldiers of the Canadian Corps were British-born until near the end of the war, when the number of those of Canadian birth who had enlisted rose to 51 percent. They were mostly volunteers, as conscription was not implemented until the end of the war (see Conscription Crisis of 1917). Ultimately, only 24,132 conscripts made it to France before 11 November 1918. In the later stages of the war the Canadian Corps was regarded by friend and foe alike as one of the most effective Allied military formations on the Western Front along with the First Australian Imperial Force and New Zealand Expeditionary Force. Although the corps was within and under the command of the British Expeditionary Force, there was considerable political pressure in Canada, especially following the Battle of the Somme, in 1916, to have the corps fight as a single unit rather than have the divisions spread out through the whole army. The corps was commanded by Lieutenant General Sir E.A.H. Alderson, until 1916. Political considerations caused command to be passed to Lieutenant-General Sir Julian Byng. When Byng was promoted to a higher command during the summer of 1917, he was succeeded by General Sir Arthur Currie, the commander of the 1st Division, giving the corps its first Canadian commander. Currie was able to reconcile the desire for national independence with the need for Allied integration. He resisted pressure to replace all British officers in high-ranking positions, retaining those who were successful until they could be replaced by trained and experienced Canadians. British staff officers made up a considerable part of the Corps – although by 1917, 7 of 12 infantry brigades were commanded by Canadians trained during the war, British regulars were the staff officers of the divisions and British officers held two-thirds of senior appointments across the infantry, artillery and Corps headquarters with only four of the most senior appointments being Canadian. Among the British officers were Alan Brooke (at the time a major of the Royal Artillery who planned the artillery barrages for Vimy Ridge and later) and William Ironside. Both became Field Marshals and held the position of Chief of the Imperial General Staff. The Canadian Corps captured Vimy Ridge in April, 1917, in a daring attack that was a turning point in the war, and as Currie called it, "the grandest day the Corps ever had". During the German Spring Offensive of the spring and summer of 1918, the Canadian Corps supported British and French soldiers while they held the Germans back. Between August 8 and 11, 1918, the corps spearheaded the offensive during the Battle of Amiens. Here a significant defeat was inflicted on the Germans, causing the German commander-in-chief, General Erich Ludendorff, to call August 8 "the black day of the German army." This battle marked the start of the period of the war referred to as "Canada's Hundred Days". After Amiens, the Canadian Corps continued to lead the vanguard of an Allied push that ultimately ended on 11 November 1918 at Mons where the British Empire had first met in conflict with Imperial German forces in 1914. At the end of war the Canadian 1st and 2nd Divisions took part in the occupation of Germany and the corps was eventually demobilized in 1919. Upon their return home the veterans were greeted by large and welcoming crowds all across the country. Total fatal battle casualties during the war was 56,638, 13.5% of the 418,052 sent overseas and 9.26% of the 611,711 who enlisted. The military effectiveness of the corps has been extensively analyzed. The corps evolved steadily following the 1915 summer campaign. As Godefroy (2006) notes, the Canadian Expeditionary Force "worked ceaselessly to convert all of its available political and physical resources into fighting power." One striking feature of the corps' evolution was its ability to exploit all opportunities for learning. This was a corps-wide activity, involving all levels from the commander to the private soldier. This ability to learn from allied successes and mistakes made the corps increasingly successful. Doctrine was tested in limited engagements and, if proven effectual, developed for larger scale battles. Following each engagement, lessons were recorded, analyzed and disseminated to all units. Doctrine and tactics that were ineffective or cost too many lives were discarded and new methods developed. This learning process, combined with technical innovation and competent senior leadership in theatre created one of the most effective allied fighting forces on the Western Front. ^ a b Weir, E. "Using the Legacy of World War I to Evaluate Canadian Military Leadership in World War II." Journal of Military and Strategic Studies. Fall 2004, 7(1) 7. Retrieved on 2010-05-24. ^ Berton, P. (1986). Vimy. Toronto: McClelland and Stewart. p. 292. ISBN 0-7710-1339-6. ^ "Spring Offensive". Loyal Edmonton Regiment Museum. 2001. Archived from the original on 2009-02-08. Retrieved 2010-05-24. ^ a b "Canada's Hundred Days". Veterans Affairs Canada. 2004-07-29. Retrieved 2010-05-24. ^ Library and Archives Canada (2008-11-07). Armistice. Canada and the First World War. Retrieved on: 2010-05-24. ^ Statistics Canada (2009-08-07). Number of casualties in the First World War, 1914 to 1918, and the Second World War, 1939 to 1945. Source: Canada Yearbook, 1948. Retrieved on: 2010-05-24. Berton, P. (1986). Vimy. Toronto: McClelland and Stewart. ISBN 0-7710-1339-6. Nicholson, Col. G.W.L. (1964). Canadian Expeditionary Force 1914–1919, Official History of the Canadian Army in the First World War, Queen's Printer. Christie, N. (1999). For King & Empire, The Canadians at Amiens, August 1918, CEF Books. Christie, N. (1997). For King & Empire, The Canadians at Arras, August – September 1918, CEF Books. Christie, N. (1997). For King & Empire, The Canadians at Cambrai, September – October 1918, CEF Books. Granatstein, J. (2004). Canada's Army: Waging War and Keeping the Peace. Toronto: University of Toronto Press. ISBN 0-8020-8696-9. Morton, D. and Granatstein, J. (1989). Marching to Armageddon, Lester & Orpen Dennys Publishers. Morton, D. (1993). When Your Number's Up, Random House of Canada. Schreiber, S. (2004). Shock Army of the British Empire – The Canadian Corps in the Last 100 Days of the Great War, Vanwell Publishing Limited. Wikimedia Commons has media related to Canadian Expeditionary Force. This page was last edited on 8 April 2019, at 13:31 (UTC).